Print the message and show it to someone else. Send (export) it to a desktop publishing program. 1. In the Mail module, with the message open, select the File tab on the Ribbon and then choose Save As (or press F12). 2. Use the Navigation pane on the left side of the Save As dialog box to choose the drive and folder in which you want to save the file. By default, Outlook initially chooses your Documents folder, but you can save the message on any drive and in any folder you want. 3. Click the File Name text box and type the name you want to give the file. Type any name you want; if you type a filename that Outlook can’t use, it opens a window telling you that the filename is not valid. 4. Click the triangle at the end of the Save as Type box, as shown, and choose Text Only as your file type. Text Only (*.txt): A very simple file format that removes all of the message’s formatting. As the name implies, it saves only the text of the message. Outlook Template (*.oft): This format is for saving a message that you want to use repeatedly in Outlook. It saves the message’s formatting as well as any attachments. Outlook Message Format (*.msg): This format keeps all the message’s formatting and attachments, but it can only be read by Outlook. 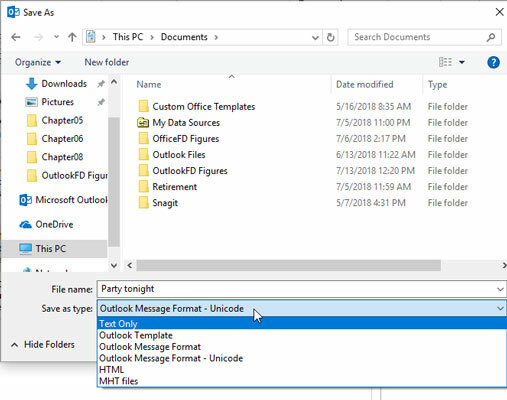 Outlook Message Format – Unicode (*.msg): This is the same as the previous file format, but it uses international characters that can be read by versions of Outlook that use different languages. This is Outlook’s default setting. HTML (*.htm or *.html): This saves a message in a file format that can be displayed in a web browser (such as Edge or Firefox) or any other application that can display HTM or HTML files (such as Word). File attachments aren’t saved, but the message formatting is kept. In addition to saving a copy of a message with the HTM file extension, a separate folder is created, which contains supporting files that the HTM file needs. MHT files (*.mht): This is the same as the HTML file format, except that an additional folder isn’t created, because all the content is stored in a single file. Applications that can display HTM and HTML files should also be able to display MHT files. 5. Click the Save button (or press Enter). The message is saved to the folder you specified in Step 2. The Save As dialog box.